Linda Burton posting from Springfield, Illinois – The grass was so green it commanded my attention. The sweet smell of spring hedge assailed my senses the minute I stepped from the car; the grass added a visual blast; wow, what did the groundskeeper do to get such green? The wind sent my hat sailing; I chased it across the lawn, wanting to stop and sit right in the middle of that luscious grass. But I plopped it back onto my head, secured the string, and kept walking; I had a purpose. Past the statue of Stephen Douglas, up a few steps, into the doors of the building that has served as this state’s capitol since 1877. The two men at security waved me towards Xray; “Where are you from?” one asked as my bag went through. I told them about the Journey. “This is my thirty-first capitol,” I said. “Is any other one as pretty as ours?” inquired the one whose badge told me he was Fred. “Well, you’ve got the best grass I’ve ever seen!” I laughed. “We’ve got the highest dome,” he said. “It is 74 feet higher than the national capitol.” “It’s shaped like a Greek cross,” Robert added, “and it is the sixth capitol we’ve had. The first was in Kaskaskia.” Fred picked up a brochure; “It cost $4,315,591 to build,” he read, “and they used 3.4 million pounds of cast iron in it.” “You guys aren’t Security, you’re PR,” I told them; “where should I start?” They directed me straight ahead, across the rotunda to the Visitor Desk. “And look up,” Fred urged. 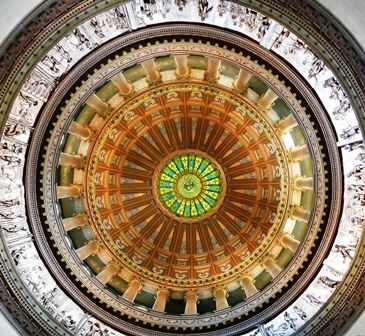 “There are 9,000 pieces of stained glass in the dome.” I walked past the open-armed statue of Illinois Welcoming The World, and looked up. I was in the middle of a kaleidoscope, a space filled with swirls of color; intricate patterns, dizzying designs. Color, and noise. Excitement off the scale; school-kid chatter bouncing off marble walls. Kids sat waiting on the floor to my right; kids peered over every balcony; kids, on one last field-trip before schools-out time. It was the county fair, the homecoming parade, and Christmas morning, all rolled into one; a home run. I signed the guestbook at the Visitor Desk, and asked my questions. “When is the next tour? Do you have written materials I can take? Are you in Session today?” “Are you the person who called a little while ago?” a voice piped up from the back. “Your voice sounds familiar to me.” I confirmed that I had indeed called to ask about parking; “Well, I’m glad you’re here.” she said. 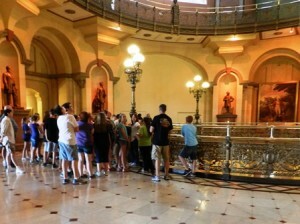 The next tour was on the hour, with the school group that sat waiting. Eager to get started, I took the Welcome brochure and headed for the elevator on my own. The Senate was in Session. I crept around the corner, peered over the fourth-floor balcony, and quietly entered the Senate Gallery, feeling awestruck now. “No photos,” whispered a guide, handing me a Senate Calendar. “Here’s what is going on today. They’re in Third Reading now and then they’ll vote.” I eased into a wooden pew and leaned forward; on the floor below people stood in clumps with heads together in discussion; some were on their phones; one was eating lunch. The main action was at the front; as the Secretary read each bill, the gavel snapped against the wooden block; POP; onto the next. I opened up my calendar; Bill 449 Public Employee Benefits; Bill 629 Regulation; Bill 1002 Criminal Law. Illinois Tax Credits, Controlled Substances, Pensions, Food Handling; the Bills were read, the gavel snapped; getting closer to the vote. I began looking around; twelve chandeliers of Austrian crystal lit the room, pinks and blues swirled on the ceiling near my head, plaster relief panels of angels in flowing gowns held trumpets of shimmering gold. 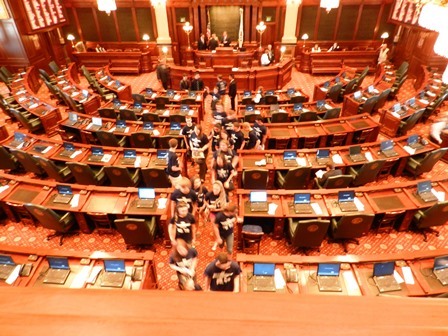 Down below, seats for the 59 senators, a laptop open on every desk; I watched as the on-screen images changed, from documents to icons to children in yellow raincoats, holding hands. The schoolkids that had been waiting downstairs caught up to me now; I eased out of the pew so they could fill the seats and headed for the House Gallery on the other side. Rick wouldn’t let me in. “There’s a tour in there now, the seats are full,” he apologized. “Give it five minutes.” The House representatives (there are 118) were not due back till 3; they’d had visitors this morning, I was told, three parents from Connecticut whose children were killed in the school massacre last December, speaking up for gun control. We chatted about the building and the level of activity today; “It’s not unusual,” Rick said. Visitors began to gather, waiting, just like me. “Photos are okay in here, but no flash,” he advised us all, as he opened the door. I leaned over the railing and surveyed the scene; a tour was filing out below. 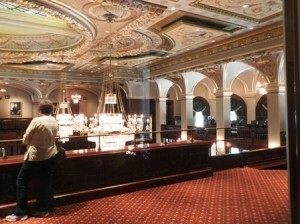 Overhead, more chandeliers, more plaster relief panels, more stained glass. 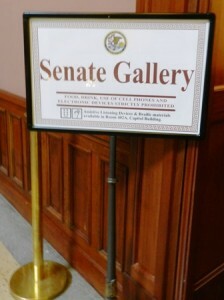 More bills to listen to, and vote. 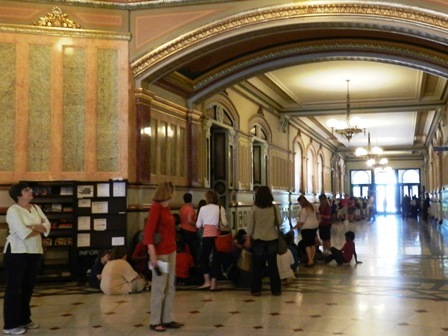 I didn’t wait for the next session to begin; I took the elevator down; the school kids walked the stairs. Second Floor, governor’s office, Hall of Governors, Old Supreme Court room, statues of famous legislators (Ulysses S Grant is one); more views from the balcony, more school kids looking. First Floor again; paintings and murals; deep reds and greens and silvers and golds and shiny echoing marble in black and white. Color, and noise. Fred and Robert were waiting for me. “Did you see everything?” Robert asked. “I saw a lot,” I confirmed. “I got to sit in on Session, I’ve never been able to catch one before. And I’ve never seen so many kids. 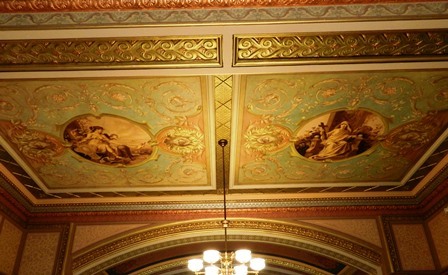 And so much color!” “Did you see Faith, Hope, and Charity?” Fred asked, pointing to the ceiling in the hallway there. He described them to me in great detail, as I got pictures of the ornate designs overhead. “Thank you so much,” I said to both men. “I will never forget your capitol. This has been a wonderful day.” They walked me to the front door, stepped outside with me. “Have a safe Journey,” said Robert, shaking my hand, “and enjoy all those capitols.” “I know you won’t see another one as pretty as ours,” said Fred. 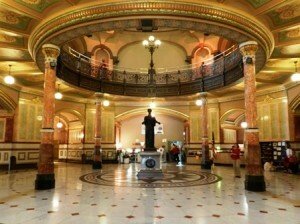 Illinois State Capitol Facts and Trivia, from the Welcome brochure. 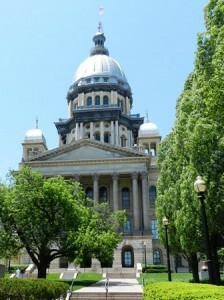 Illinois has had six capitol buildings – one in Kaskaskia, three in Vandalia, and two in Springfield. 1867 Legislature authorized funds for the current capitol. 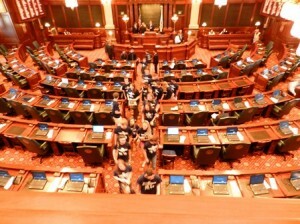 1877 Legislature meets in new building. 750,000 cubic feet of cut stone, 20 million bricks, 1.4 million pounds of wrought iron, and 3.4 million pounds of cast iron were used in construction. 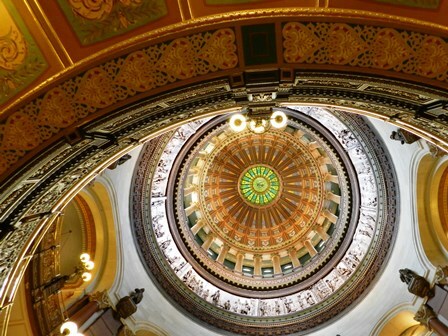 Dome foundation is 92.5 feet in diameter; 17-foot thick limestone walls are based on solid rock 25.5 feet below grade line. 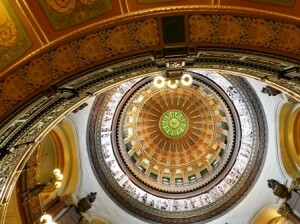 Dimensions east-west 268 feet; north-south 379 feet; dome height 361 feet; flag height 405 feet. There are 110 steps from first floor to fourth floor gallery. Every doorknob in the building is imprinted with the state seal. Note: the Illinois State Capitol @ 2nd and Capitol Streets in Springfield is open 8-4 weekdays with tours on the half-hour; 9-3 weekends with tours on the hour; closed Thanksgiving, Christmas Eve/Day, New Year’s, and Easter. Large group tours by appointment, call Visitors Bureau @ 217-789-2360.